Most products are built to order and require lead time. Please call or email for lead times before ordering. Use this page to quickly browse our products for pricing. Approximate shipping charges are listed at the bottom of the page. To place an order, please visit our Online Store. Drop-in forward facing rowing system for installation in canoes or touring rowboats. Includes frame, seat, oars, mounting pads, owner's manual. ​Tall option for rowers 6'-4" and taller (no extra charge). Narrow cockpit option for boats with inside cockpit width of less than 26" at midpoint (no extra charge). 16-1/2 ft. FrontRower™ ready canoe designed for solo rowing or rowing with a passenger. Shown with FrontRower™ rowing system (purchased separately) installed in solo position. Constructed with kevlar layup and aluminum gunwales. 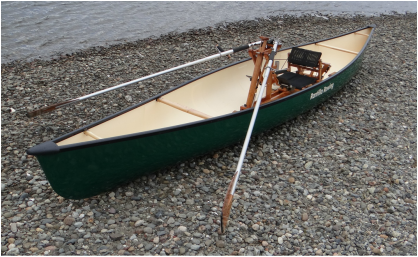 16-1/2 ft. custom built touring rowboat designed for solo rowing or rowing with a passenger. Shown with FrontRower rowing system (purchased separately) installed in solo position. Plywood and fiberglass construction with solid cherry gunwales. 18 ft. custom built touring rowboat designed for doubles rowing, solo rowing, or solo rowing solo with a passenger. Shown with two FrontRower rowing systems (purchased separately) installed. Plywood and fiberglass construction with solid cherry gunwales. Cherry hardwood seat with suction cup mounting. Matches FrontRower seat in style and comfort. Attaches to center column. Hold fishing rod or beach type umbrella in place in vertical position. 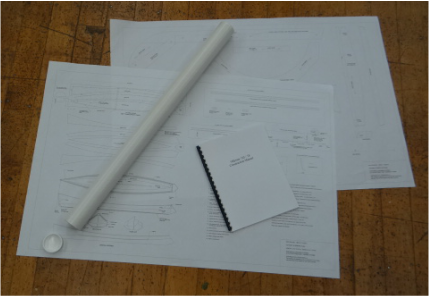 Plans for building (1) Odyssey touring rowboat (hull only). 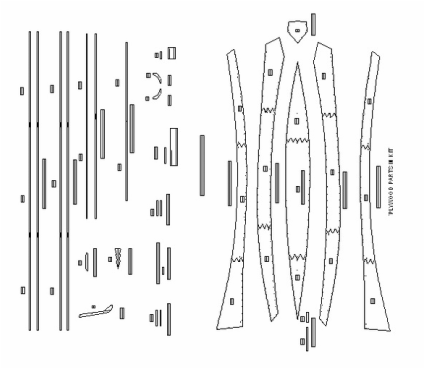 Plan sets include full size patterns for transom, stem, breast hook, and transom knees; large scale general arrangement drawing; construction details for various parts; a table of offsets (X-Y coordinates) for "lofting" the planks; and a detailed construction manual and materials list. Precut wood parts kits contain all the wooden parts needed to build an Odyssey touring rowboat (hull only). Includes detailed construction manual and materials list. Additional materials are needed. Epoxy resin, fiberglass cloth, fillers and paint are not included. Shipping charges for most items are automatically added when you order from our Online Store. The following list is a rough approximation of the shipping costs for popular products to popular areas. Your actual costs will vary based on where you live. Shipping arrangements for Rowing Canoes and Finished Rowboats are handled manually. Call or email for details.